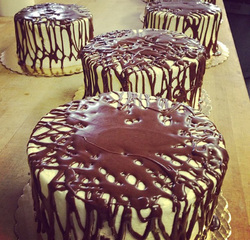 Our most popular store cake, the chocolate sundae cake is exclusive to Mondelli's Bakeshop. It is a moist delicious double layer chocolate cake iced with buttercream icing, and chocolate cooked icing drizzled on top. It is a customer favorite! Tuesdays - Fridays: 7 a.m. - 5 p.m.
​Saturdays: 7 a.m. - 3 p.m.